Puree of chickpeas, tahini, & lemon topped w/ fresh herbs & extra virgin olive oil. Pita on the side. A delicate mixture of parsley, onions, cracked wheat & tomatoes seasoned w/ extra virgin olive oil, lemon & herbs. Pita on the side. Two lean beef shells mixed w/ crushed bulgar wheat & stuffed w/ spiced ground beef, roasted onions, & pine nuts then deep fried in peanut oil. Served w/ a side of plain non-fat yogurt & Lebanese Salata. Puree of charbroiled eggplant, tahini, garlic, & lemon topped w/ fresh herbs & extra virgin olive oil. Pita on the side. Puree of fava beans, garlic, extra virgin olive oil & lemon topped w/ diced tomatoes & parsley. Pita on the side. Green beans sauteed w/ onions, herbs, large whole cloves of garlic, tomato & extra virgin olive oil. Pita on the side. Mildly spiced vegetarian patties made w/ chick peas, fava beans, parsley, & scallions. Fried in peanut oil & served w/ Tahini Yogurt sauce. Pita on the side. Char-grilled curry chicken, onions, peas, herbs & spices folded into a pita pie, topped w/ diced tomatoes & scallions. A spinach & feta cheese pita pie, topped w/ crumbled feta & scallions. A combination of ground beef, tomatoes, onions, pine nuts & herbs stuffed in a pita pie topped w/ cheddar cheese & scallions. For those who don't like it too spicy; half lentil, half chili. Homemade w/ the freshest nine vegetables available. Fresh‎ vegetables in a rich vegetable broth topped w/ chunks of chicken. Cooked lentils w/ Swiss chard, celery, potatoes & sauteed onions; strictly vegetarian! Lentil soup topped w/ charbroiled chunks of chicken. Red kidney beans, vegetables & fresh chunks of tomato are the base for this mildly spicy & hearty chili. Our chili topped w/ charbroiled chunks of chicken. Half lentil, half chili topped w/ charbroiled chunks of chicken. No sulfites, starch, additives or any type of preservatives are used in our food preparation - only fresh vegetables & meats. All soups are homemade. Mixed greens, calamata olives, cucumbers, & sliced tomato & topped w/ feta cheese, & scallions. Aladdin's dressing on the side. A flavorful mix of freshly chopped spinach & romaine, squash, zucchini, grapes, dried cranberries, tomatoes & chopped marinated grilled chicken, tossed w/ our Honey Dijon dressing & topped w/ pine nuts & feta cheese. A delightful combination of our Lebanese Salata, freshly chopped spinach & romaine, calamata olives, banana peppers & chopped marinated grilled chicken, tossed w/ our house dressing & topped w/ pickled turnips & feta cheese. Mixed greens tossed w/ Almond Nut dressing topped w/ roasted almonds, parmesan cheese, cucumber, mushrooms, scallions, & alfalfa sprouts. Spinach,‎ cucumbers, mushrooms, scallions, alfalfa sprouts, & sliced tomato. Mixed greens cucumbers & sliced tomato topped w/ chicken salad, scallions, & roasted almonds. Mixed greens & Lebanese Salata tossed w/ toasted pita chips, lemon, garlic, sumac, extra virgin olive oil, & herbs. Chopped tomatoes, cucumber, green pepper, scallions, parsley, onion, extra virgin olive oil, lemon, & herbs. Pita on the side. Four Falaffel patties on a bed of mixed greens w/ cucumbers, scallions, & sliced tomato. Tahini Yogurt dressing on the side. Mixed greens, calamata olives, cucumbers, & sliced tomato topped w/ smoked turkey & scallions. Tahini‎ Yogurt dressing topped w/ lightly seasoned grilled beef strips, onions, sliced tomatoes, diced cucumbers & flakes of sweet basil. Pureed eggplant sliced tomatoes, feta cheese, char-grilled slices of eggplant, slivered calamata olives & sprinkled w/ oregano. Honey Dijon dressing & Garlic Sauce topped w/ chunks of char-grilled chicken tenders, julienne green peppers & diced scallions. Our mildly spiced vegetarian chili topped w/ cheddar cheese, diced scallions & Tahini Yogurt dressing. Our famous Hummos serves as a base for this unique pitza topped w/ seasoned ground meat, diced tomato, pine nuts & garnished w/ chopped parsley. Feta cheese, zaatar (an ancient Mid-East herb), diced cucumbers, sliced tomatoes, julienne green peppers & slivered calamata olives & garnished w/ flakes of sweet basil. Tahini Yogurt dressing topped w/ chunks of falaffel, yellow pepper rings, & diced tomatoes & garnished w/ chopped parsley. A whole pita stuffed w/ mixed greens, sliced tomato, cucumber, mushrooms, scallions & alfalfa sprouts. Chicken salad layered w/ mixed greens, topped w/ roasted almonds & alfalfa sprouts served in a whole pita. Char-grilled tuna steak layered w/ mixed greens, topped w/ alfalfa sprouts served in a whole pita. Mildly spiced vegetarian patties fried in peanut oil, layered w/ mixed greens & sliced tomato served in a whole pita. Tahini Yogurt on the side. Our famous lentils & rice layered w/ mixed greens, Lebanese Salata & topped w/ toasted onions served in a whole pita. Smoked turkey breast layered w/ mixed greens, sliced tomato, & cheddar cheese served in a whole pita. Baba layered w/ mixed greens, sliced tomato, cucumber, scallions, & alfalfa sprouts served in a whole pita. A mixture of parsley, onion, cracked wheat, & tomato seasoned w/ extra virgin olive oil, lemon, herbs, & layered w/ mixed greens served in a whole pita. Our famous Hummos layered w/ mixed greens, sliced tomato, cucumber, scallions, & alfalfa sprouts served in a whole pita. Char-grilled lean beef tenderloin topped w/ grilled tomatoes, green peppers, & onions. Topped w/ greens, turnips, pickles, & Tahini Yogurt dressing, rolled in a pita. Marinated char-grilled curry chicken, peas, onions & banana peppers. Topped w/ tomatoes, chedder cheese & Honey Dijon dressing. Sauteed lean beef w/ pine nuts, onion, tomato, herbs & spices topped w/ cheddar cheese, turnips, pickles, & sliced tomato, rolled in a pita. Ground lean beef mixed w/ onions, parsley, herbs & spices, & then char-grilled topped w/ tomato, onion, & Tahini Yogurt dressing, rolled in a pita. Marinated‎ char-grilled chicken tenderloins, greens, tomato, turnips, & pickles topped w/ Aladdin's famous garlic sauce, rolled in a pita. Char-grilled tuna steak, greens, tomato, onion, turnips, & pickles topped w/ Tahini Yogurt dressing, rolled in a pita. Lightly seasoned beef strips, greens, tomato, onion, turnips, pickles, & parsley topped w/ Tahini Yogurt dressing, rolled in a pita. Char-grilled lean beef tenderloin, feta cheese, greens, tomato, & onion topped w/ Aladdin's dressing, rolled in a pita. Marinated char-grilled chicken w/ tomato & onion topped w/ Tahini Yogurt dressing, rolled in a pita. Grilled smoked turkey breast, greens, & tomato topped w/ cheddar cheese, rolled in a pita. Mildly spiced vegetarian patties fried in peanut oil topped w/ greens, tomato, turnips, pickles, & Tahini Yogurt dressing, rolled in a pita. Our famous Hummos & Tabouli topped w/ greens & tomatoes, rolled in a pita. 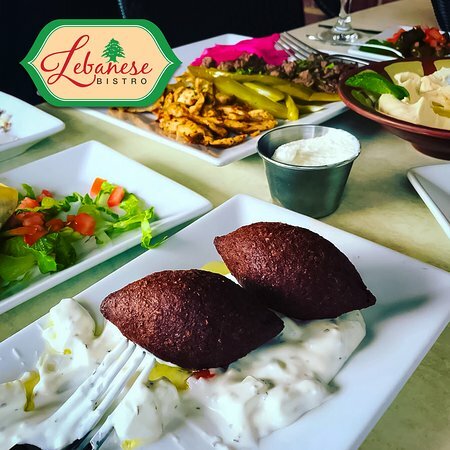 Baba topped w/ greens & Lebanese Salata, rolled in a pita. Stuffed grape leaves topped w/ feta cheese, tomato, onion, & Aladdin's dressing, rolled in a pita. Mildly spiced vegetarian patties fried in peanut oil topped w/ our famous Hummos, greens, tomato, turnips, pickles, & parsley, rolled in a pita. Mildly spiced vegetarian patties fried in peanut oil & topped w/ Baba, greens, tomato, turnips, pickles, & parsley, rolled in a pita. A bed of steamed lentils & rice topped w/ Lebanese Salata, & garnished w/ toasted onions. 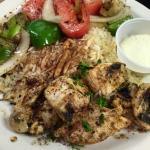 Our grilled Chicken Mishwi & Beef Kafta on a bed of seasoned white rice w/ vermicelli. Served w/ a mixed greens salad topped w/ Lebanese Salata, along side Hummos & Falaffel. Pita on the side. Our famous Hummos topped w/ Shawarma, pine nuts, diced tomato, & parsley. Served w/ pita on the side. Our famous Hummos topped w/ Chicken Mishwi, diced tomato, & parsley. Pita on the side. Char-grilled ground lean beef mixed w/ onions, parsley, herbs & spices. 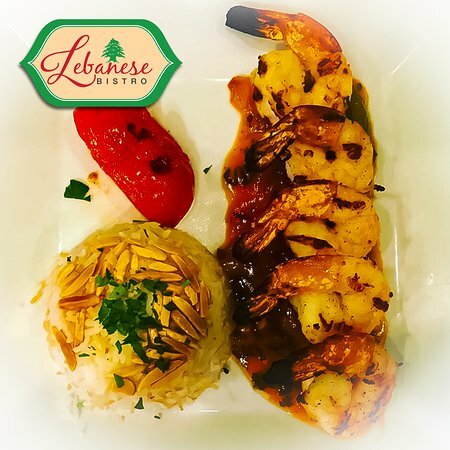 Served w/ seasoned white rice w/ vermicelli, topped w/ sauteed pine nuts, almonds, & cinnamon. Your choice of Garlic or Tahini Yogurt dressing. Pita on the side. Je ne peux pas faire suffisamment de cet endroit. La nourriture est délicieuse et le service est tout aussi c'était divin ! A chaque fois que nous irons, nous avons dû prendre un repas à emporter pour demain ! ! Parfait pour un déjeuner rapide et bien plus encore ! J'ai dîné ici quelques fois et mon mari et moi même commandé une fois de manger à la maison. Excellente cuisine et le service. J'ai aimé le kebab Kafka, houmous, concombres et des yaourts. La nourriture et le personnel qui le servait étaient super. J'ai trouvé les arrangements de sièges très inconfortable. Nous préférons faire prendre. Un grand choix de plats méditerranéens fraîches de style. Pitzas, des enveloppements, des soupes et des assiettes. Soupes sont frais et faite maison et parfait pour une journée froide. De tous les moyen-orientales à thème restaurants que j'ai mangé, c'est le meilleur. La nourriture ici est très parfumée, à un prix raisonnable, et le service est très bon. J'adore les saveurs de toutes les entrées que j'ai essayé. Ce restaurant offre des places assises à l'extérieur pour les beaux soirs d'été. L'endroit est propre et le service est sympa, mais la nourriture n'était pas terrible. 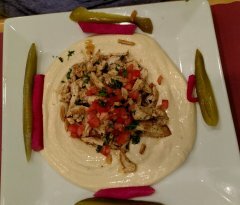 J'ai eu de meilleure nourriture libanaise au Cedar Cafe également à Burke. 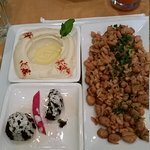 Obtenez des réponses rapides du personnel et des anciens clients de Lebanese Bistro.